NC DNA Day » The Bionic Mushroom – A New Superhero? A fungus among us can now produce electricity with the help of cyanobacteria – a certain species of microbe. 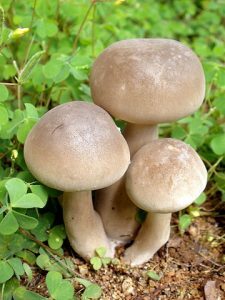 You read that right, scientists in New Jersey have harnessed nature’s diversity to generate bionic, electricity producing, mushrooms. Microbes, microscopic single-celled organisms, can produce a variety of materials and functions that are advantageous for human use in the environment, in medicine, and in energy production. Microbes are able to evolve at a much faster rate than other organisms due to their short reproductive cycle. This has resulted in many microbial species with special functions. Some microbes have evolved to eat plastic due to all of the plastic littering our environment. Other microbes have been engineered to produce insulin, an important molecule for pancreatic function. Now some microbes can even produce fuel! Cyanobacteria are a class of microbes that are able to use photosynthesis, much like plants, to harness energy from the sun to produce their own food. Cyanobacteria contain chlorophyll, which captures and uses energy from the sun. Chlorophyll is also found in the chloroplasts of plant cells and gives plants and cyanobacteria their green color. (Image below – Chloroplast vs cyanobacterium). Some microbes are also able to have symbiotic relationships with plants and fungi, which means they live together and help each other survive. An example of a symbiotic relationship is that between the sea anemone and the clownfish, as seen in the movie Finding Nemo. The sea anemone is poisonous to other animals, but not the clownfish, so the clownfish can live and hide safely inside. In return, the clownfish gets rid of parasites that may attack the sea anemone and can provide nutrients to the sea anemone. On the mushroom caps, the cyanobacteria are printed very tightly on top of the abiotic nanomaterial, graphene nanoribbon (a non-living, microscopic material, to left). Graphene nanoribbon has high electrical conductivity and transfers energy from the cyanobacteria as they undergo photosynthesis, to an energy storage cell, like a battery. The scientists created a circuit to measure how much electricity the bionic mushroom generated from the cyanobacteria. A constant, high stream of electricity was generated over several days, meaning that this new bionic mushroom electrical system can reliably and stably produce energy. The authors hope that through their 3D bionic printing method, other scientists can use nanomaterial and other species of bacteria to produce large amounts of resources such as energy and bioluminescence in the future. This study sets a new standard for the development of green, renewable energy. It also illustrates the ways that we can use the evolutionary traits of microbes to help advance technology and medicine to save our planet.